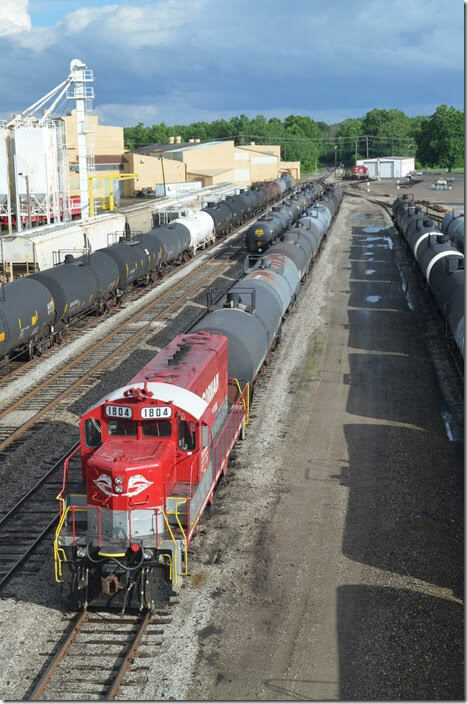 While driving through Akron OH, on I-76, I noticed a yard and engine terminal on the north side of the road. 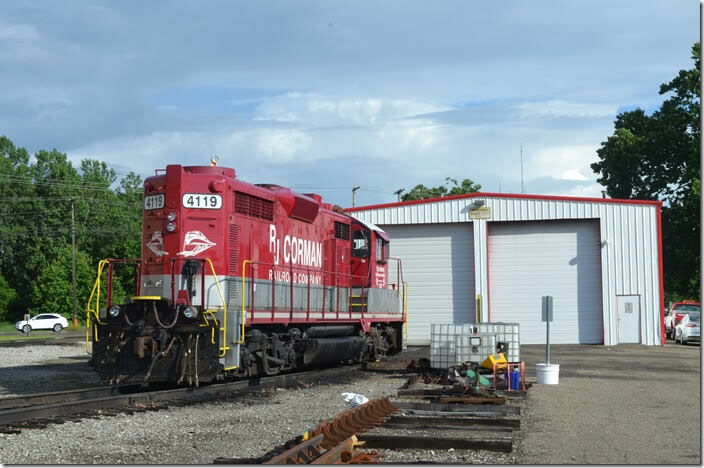 The next day we exited and weaved our way back to the former Akron, Canton & Youngstown Brittain Yard. 1. 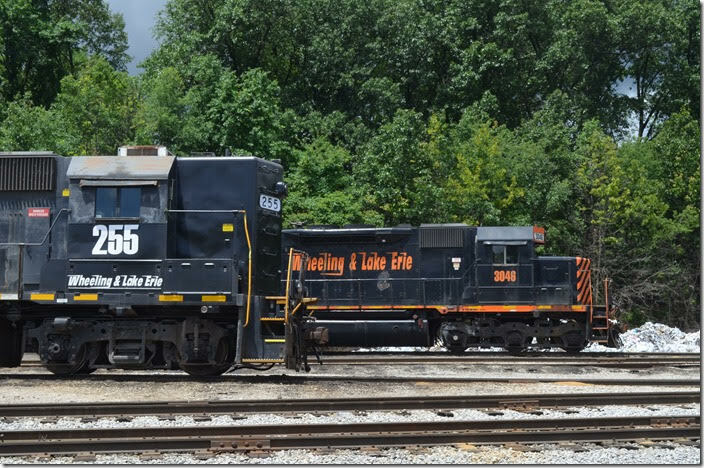 W&LE 255-200 and 3046-6988 rest on Saturday, 06-23, at Brittain Yard on the eastern outskirts of Akron. Brittain OH. 2. 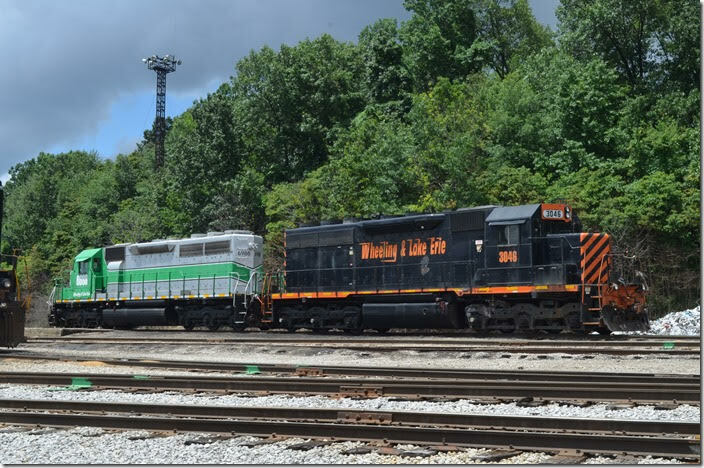 WLE 3046 has the frame of a SD35 but the fans of a SD40. 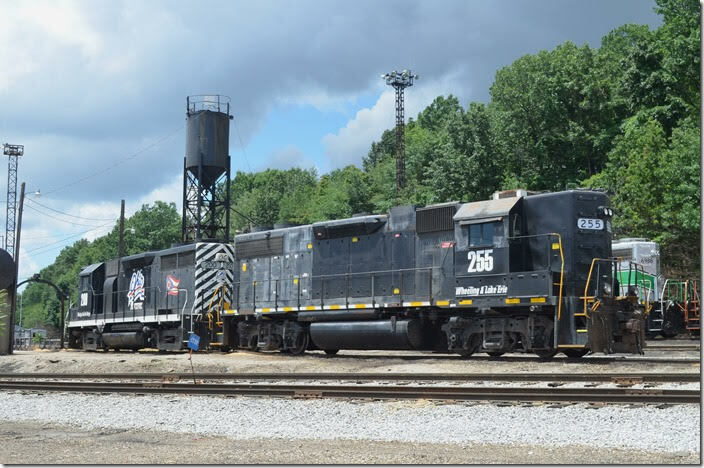 It’s former EMD SD40X demo 434G built in 1965! Demos 434A-434H were sold to the Union Pacific in 1966; W&LE retains its UP number. WLE 6988 is a “SD40U” and appears in the FURX paint scheme. 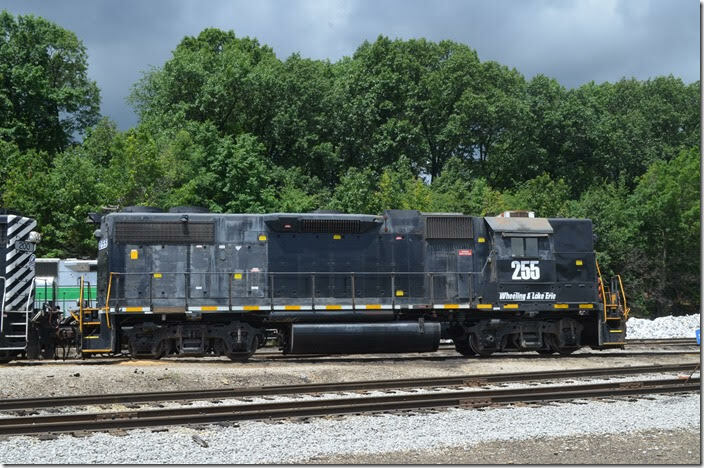 It came from CSX and was originally C&O 7507. WLE 3046-6988. Brittain OH. 3. 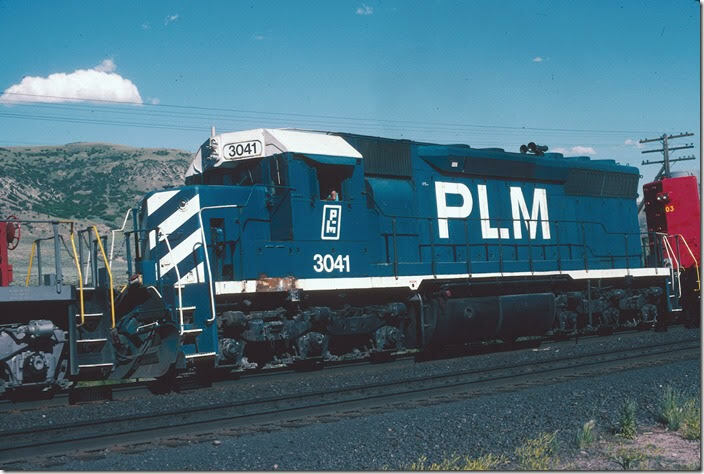 PLM 3041. This is ex-EMD 434-B on lease to the Utah Railroad at Soldier Summit UT, in 1993. The first six of the eight demonstrators had the flared radiators seen later on SD45s. 4. WLE 255 is an ex-NS GP38-2 that was originally Southern 5153. WLE 255-200. Brittain OH. 5. WLE 255. View 2. Brittain OH. 6. WLE 255 and 3046. Brittain OH. 7. 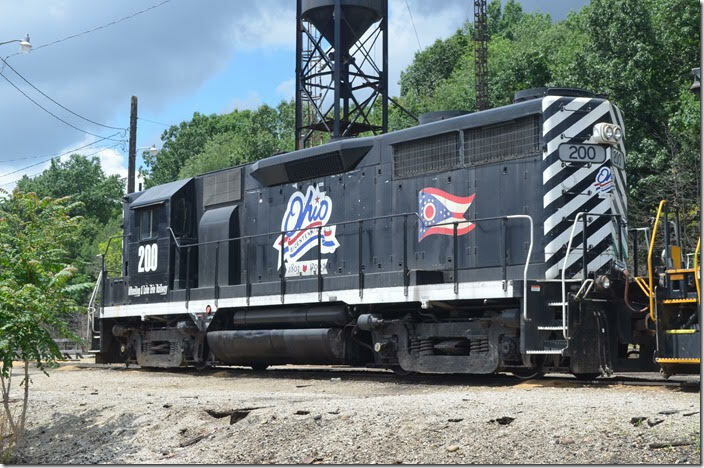 Commemorating the Ohio Bicentennial 1803-2003, WLE 200 was one of the original units turned over by NS to W&LE. WLE 200 was originally Southern Ry. (Savannah & Atlanta). Brittain OH. 8. 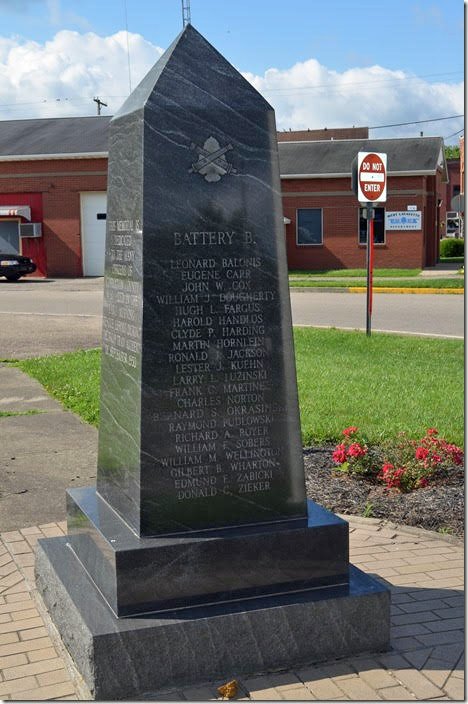 WLE 255-200 3046-6988 Brittain OH 0726. The shop is in the background. There was no one around. 9. 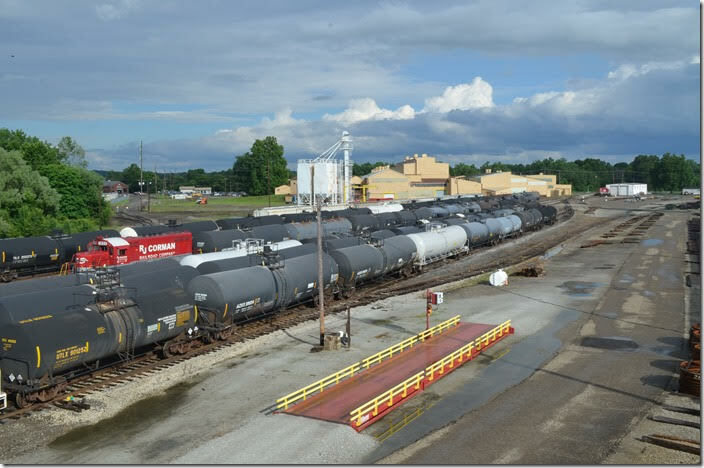 Late in the day we paused at Dover OH, to shoot R. J. Corman’s yard. They operate north over the former B&O Cleveland, Lorain & Wheeling line. 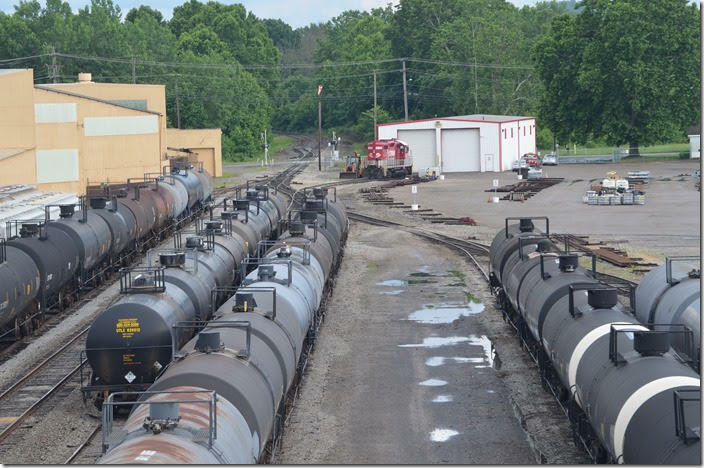 There are several industries at Dover and New Philadelphia as evidenced by the yard. 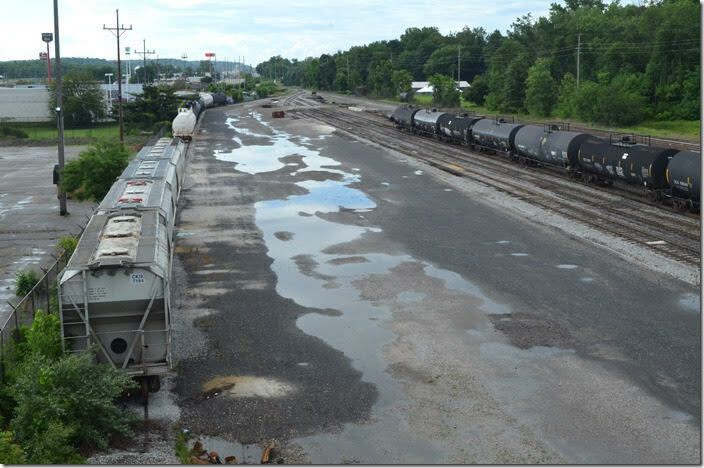 RJC yard. Dover OH. 10 The yard is just off I-77. These were taken from a street bridge looking north. 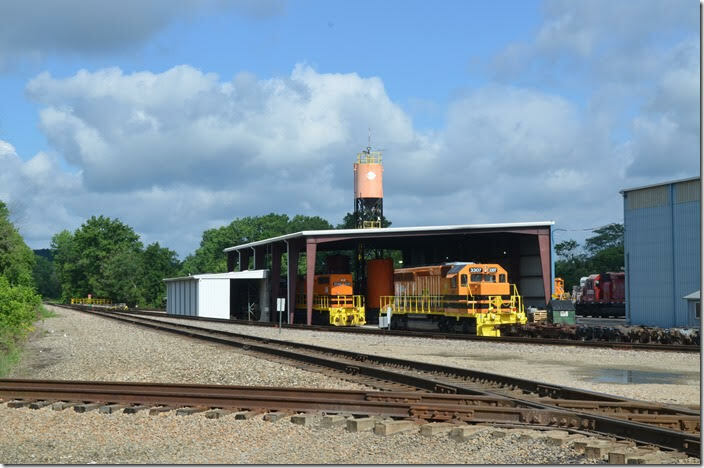 RJC yard. View 2. Dover OH. 11. 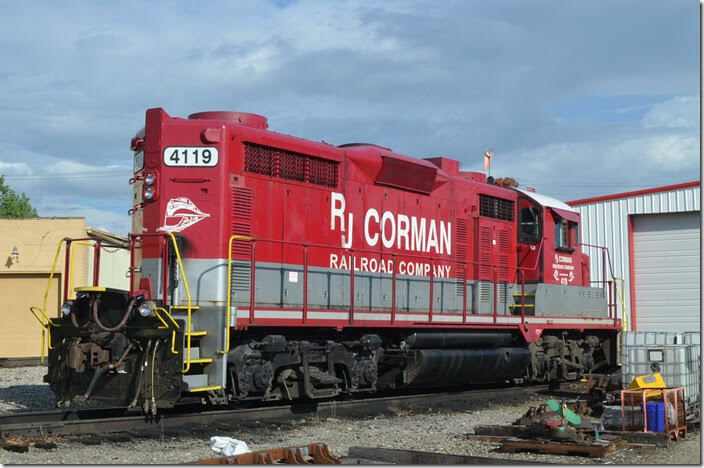 RJC 1804 is an ex-CSX “GP16” that was originally SCL, nee-ACL. Dover OH. 12. RJC 1804. View 2. Dover OH. 13. Looking south toward New Philadelphia. B&O last used their 2-8-8-4 EM-1s on this line hauling coal from Benwood and Holloway to Lorain. 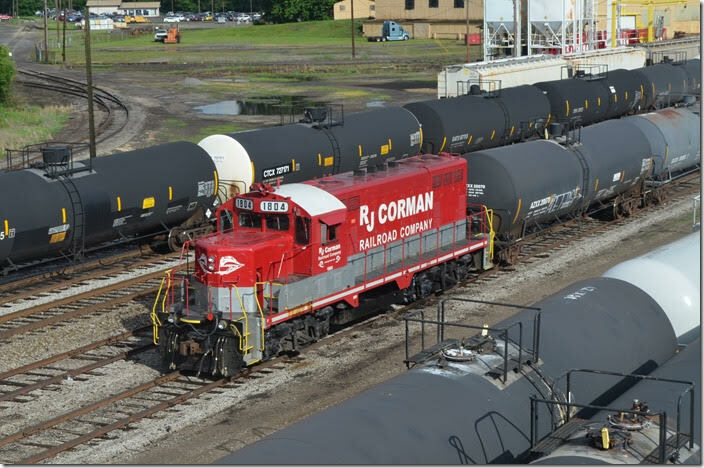 RJC yard. Dover OH. 14. Parked in front of the shop was “GP20E” that came from the Southern Pacific. RJC 4119. Dover OH. 15. RJC 4119. View 2. Dover OH. 16. RJC 4119. View 3. Dover OH. 17. On the way home, Sunday 06-24, we detoured off I-77 to Morgan Run OH. Ohio Central SDs 3307 and 3340 take the day off at the deserted loco shop. 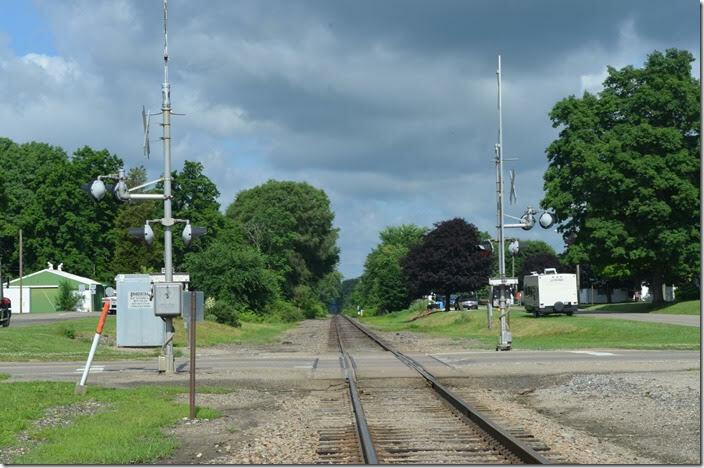 The former PRR “Panhandle” is the main line here. It is officially the Columbus & Ohio River (CUOH). The former W&LE is the lesser used line in the foreground. 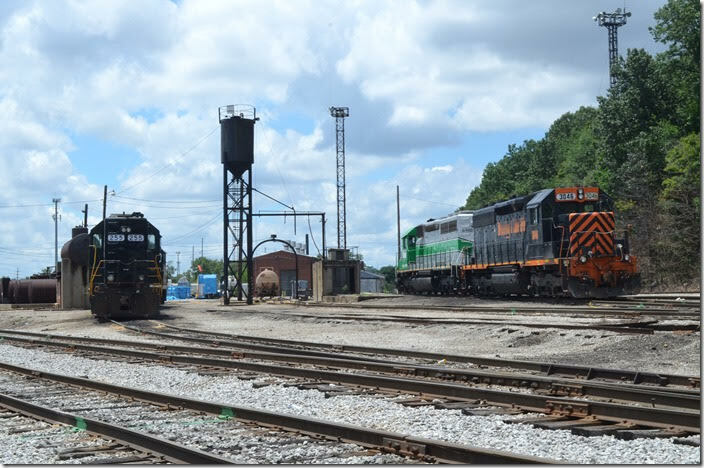 It is officially the Ohio Central (OHCR). 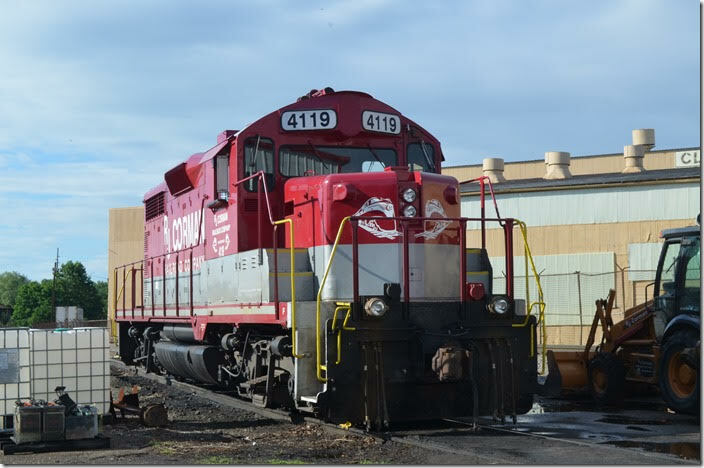 Genesee & Wyoming Inc., the parent company, owns or manages 120 railroads. OC 3307 3340. Morgan Run OH. 18. 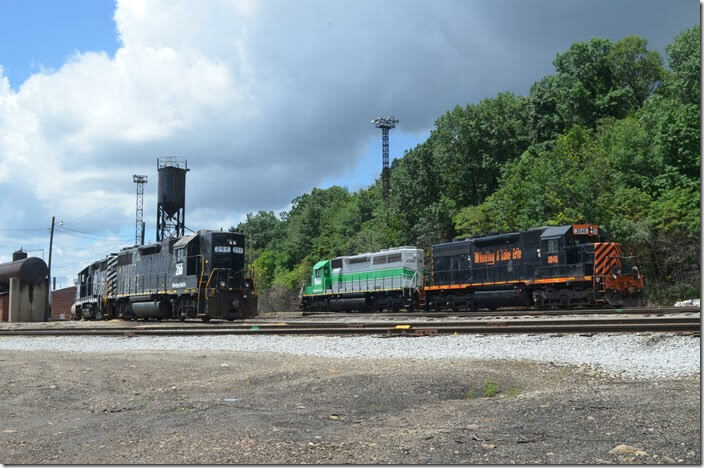 In PRR and PC days there was a tower at Morgan Run to control the interlocking with W&LE-NKP-N&W. In Conrail days after the Panhandle had been downgraded, both roads were required to stop before proceeding. 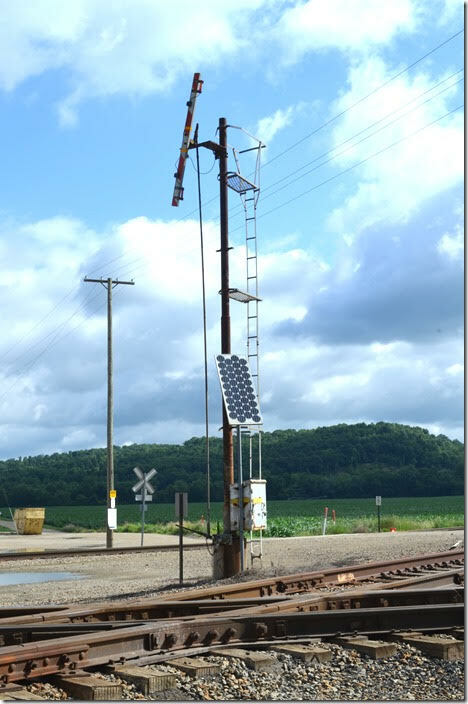 This looks like a manual tilting stop signal on the old Zanesville Br. I suppose the solar cells are for the lights. It is all G&W-owned now. OC interlocking signal. Morgan Run OH. 19. 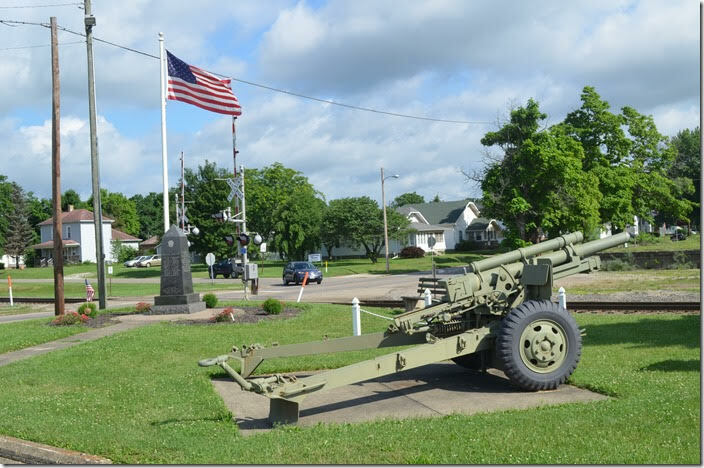 The main reason for our detour was to visit the memorial in West Lafayette OH, to the tragic troop collision near here in 1950. There is a thorough article on this collision in the Autumn 1988 issue of The Keystone, Vol. 21, No. 3, the quarterly magazine of the PRR Technical & Historical Society. 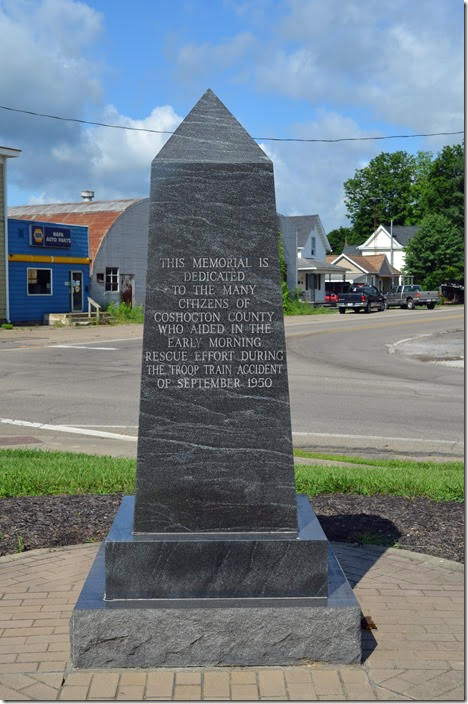 PA National Guard wreck memorial. West Lafayette OH. 20. PA National Guard wreck memorial. View 2. West Lafayette OH. 21. PA National Guard wreck memorial. View 3. West Lafayette OH. 22. PA National Guard wreck memorial. View 4. West Lafayette OH. 23. 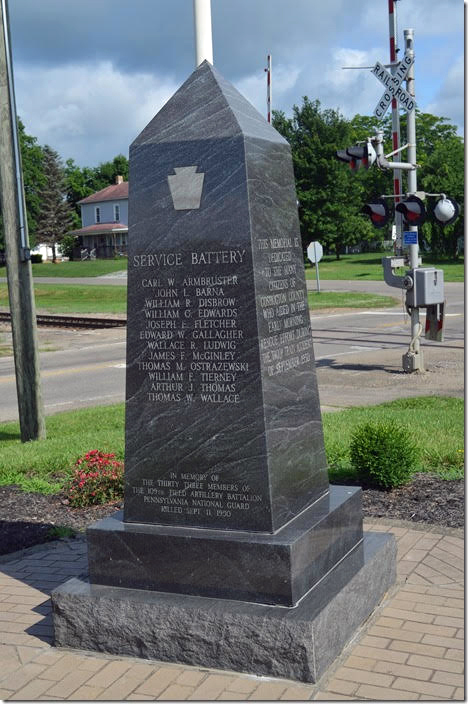 PA National Guard wreck memorial. View 5. West Lafayette OH. 24. Looking east from West Lafayette on tangent track. 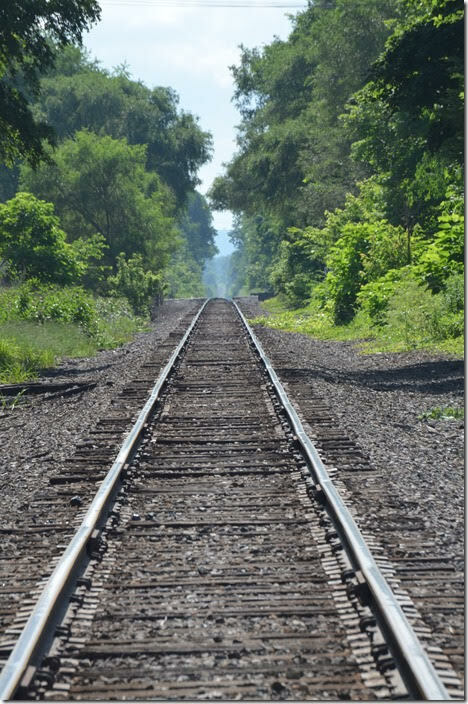 In 1950, the PRR Panhandle main line was double track. The accident happened about a mile down the track. Basically the w/b troop train stopped because of brake problems. No. 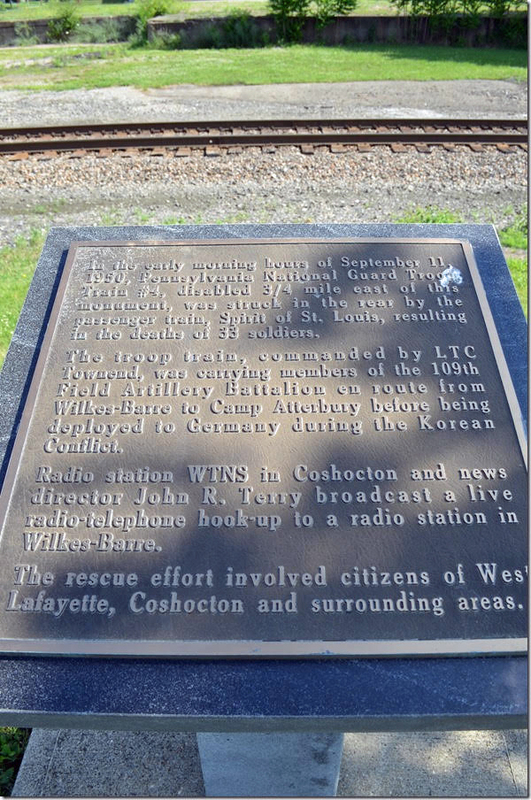 31, the “Spirit of St. Louis”, ignored an approach signal and rear-ended the troop train which was stopped a few feet west of the red block signal. PRR 31 was headed by a pair of Baldwin BP20 passenger diesels. This lapse of operating rules resulted in the deaths of 33 soldiers. OC looking east from West Lafayette OH. 25. OC looking west toward Morgan Run. West Lafayette OH. 26. 105 MM howitzer. My father fired these when in the army. This piece wasn’t being transported on the train. West Lafayette OH. 27. 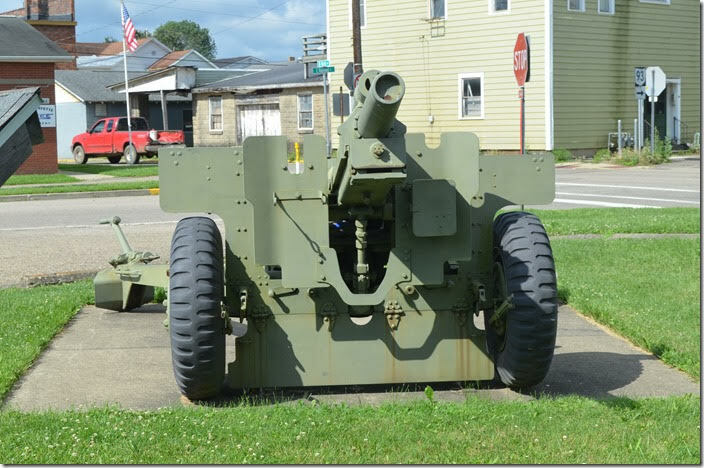 105 mm howitzer. Engraved details. West Lafayette OH. 28. 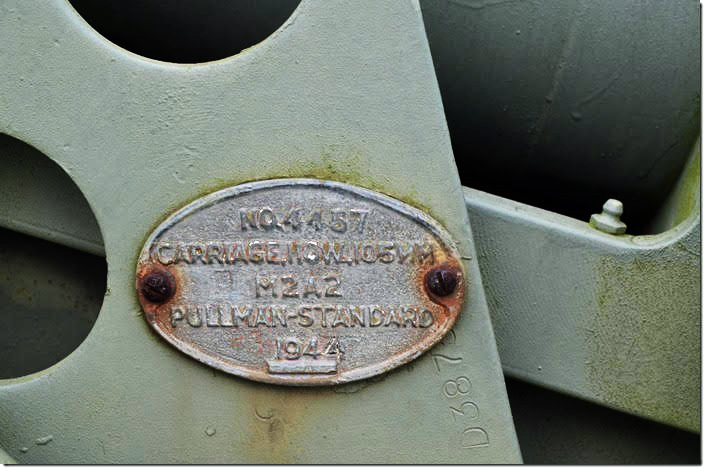 The carriage was manufactured by railroad car builder Pullman-Standard in 1944. 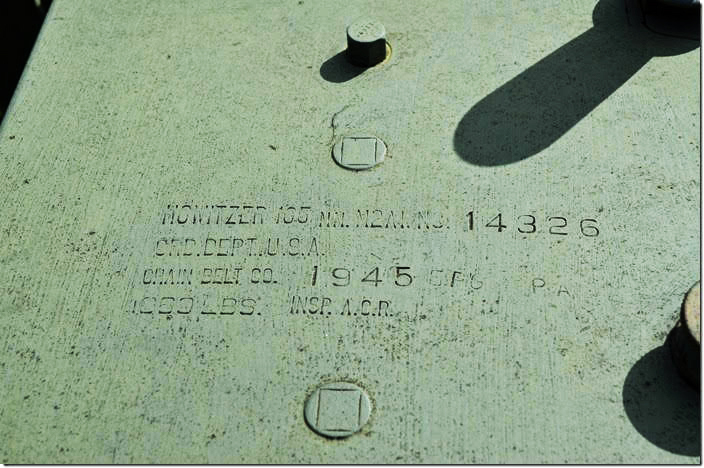 105 mm howitzer manufacturer plate. West Lafayette OH. 29. 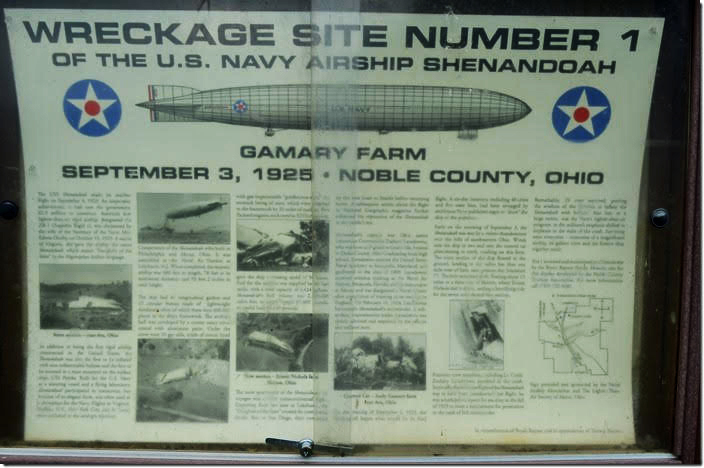 US Navy Shenandoah crash memorial. Ava OH.